Darkness engulfs the galaxy. Under the rule of the Dark Lords of the Sith, the Empire controls countless star systems through fear and oppression. With the Jedi destroyed, seekers and sentinels, wardens and warriors, pathfinders and peacekeepers must learn to use the Force and restore peace and justice to the galaxy. 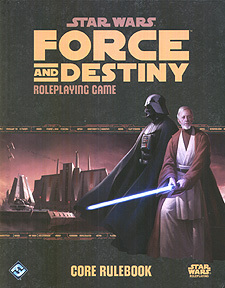 Learn the ways of the Force and embark on your own adventures in the Star Wars galaxy with the Star Wars: Force and Destiny Roleplaying Game. This complete tabletop roleplaying game dives into the struggle between the light and dark side of the Force in a time of galactic civil war. Craft a lightsaber, free the oppressed and downtrodden, and duel dreaded agents of the Sith in the conflict to bring balance to the Force. A dynamic dice mechanic that goes beyond success and failure to enhance narrative gameplay. Full rules for playing six careers, eighteen specializations, and eight species, enabling flexible character creation and development. Starship combat, customizable equipment, Force powers, dangerous adversaries, and much, much more!